HazMat Command is a two-tape training series on incident command, produced by Emergency Film Group for the emergency response community. When a hazmat incident occurs, somebody has to be in charge. This person is called the incident commander. It is the incident commander's job to implement a command system, to set up a command station, to oversee support personnel, and to bring the incident to a successful termination. The major concerns during the emergency are the safety of the emergency responders and the protection of civilians and the environment. The responsibilities of the incident commander, especially during the confusion of a hazardous materials emergency, can appear to be overwhelming. But with proper training and planning, the incident commander and the emergency response team can work together in an organized manner to conclude the incident in an efficient, effective and professional manner. HazMat Command is a two-tape video series designed to provide training and assistance to personnel who may be called upon to assume control of a hazardous materials emergency. 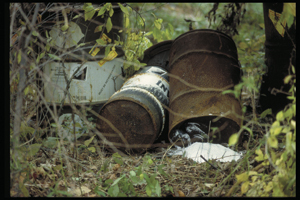 The first film, Sizing up the Hazardous Materials Incident, tells how to set up a command system and discusses methods of gathering information at hazardous materials incidents. Part two of HazMat Command, Managing the Hazardous Materials Incident, shows how to organize the incident scene and discusses command post operations. OSHA standard 1910.120, Hazardous Waste Operations and Emergency Response (Hazwoper) states that Incident Commanders must train and their employers must so certify. HazMat Command is a valuable aid in setting up a training program that conforms to OSHA standards. Part of the HazChem Series. Available separately or as a part of the series. Health and safety training for hospital personnel. Peer reviewed ... Provides at least eight hours of training in the competencies required by OSHA for healthcare personnel to be certified at the Operations Level. 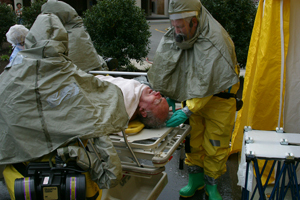 An incident involving mass casualties from a hazardous material or WMD event would place healthcare facilities and staff at risk of contamination. 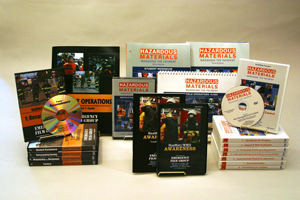 This training package includes 4 safety training videos/DVDs plus an Instructor Guide and Workbook. Identify patients who may have been contaminated with dangerous substances. 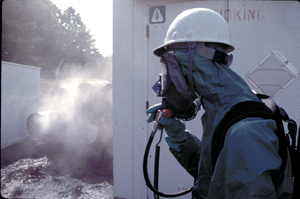 SAVE $1,668 on Hazwoper training! Specially selected collection of training programs addresses Awareness, Operations, Technician and Command level training and competencies for the 2007 version of NFPA 472. Includes 18 DVDs or videos, 5 Leader's Guides, 3 texts and 1 CD-ROM. 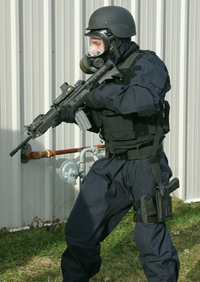 Designed for law enforcement, fire departments, emergency management and other emergency response . Training for emergency responders who carry out air sampling activities at hazmat incidents. Training to recognize the difference between a hazmat incident and other emergencies . 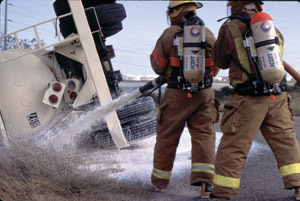 Provides training to emergency response personnel who may be called upon to respond to a leak. Package includes DVD or video plus CD Rom with Instructor's Resources: 4 Power Point presentations, Post Seminar quiz, and pertinent documents in .pdf format. Note: Includes a Guide that outlines an 8-hour training course in Operations Level competencies. The package comprises five videos or DVDs plus a Leader's Guide* and teaches the core competencies required for certification at the Operations Level. It helps set up a program to apply the lessons learned to your jurisdiction or facility. Also valuable for annual refresher training! See product descriptions below. Sizing up the incident site and gathering information. The most comprehensive study of hazmat containers anywhere! Formerly sold as First Responder Awareness. Now completely updated to address the revised NFPA 472 Standard! The included Leader’s Guide outlines a 4-hour (or longer) training seminar, including pre- and post-seminar tests, ideas for activities, a copy of the script, and reference materials. This program is designed for police officers, fire fighters, security, highway workers, EMS, industrial personnel and others who could be the first on the scene of an emergency involving hazardous materials or terrorism. 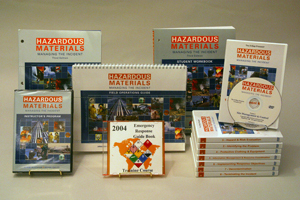 "Hazmat Containers" is part of the Hazmat Operations series of Hazwoper training videos. 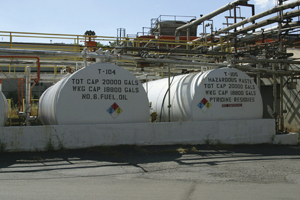 "Hazmat Containers" is available separately or as a part of the series. 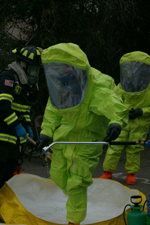 Save almost $500 on a complete approach to hazmat incident management! All-new Field Operations Guide, by Toby Bevelacqua, for use in the classroom or at the incident scene. 176 pages. Provides training to emergency response personnel who may be called upon to respond to a leak, spill. How to maintain a defensive approach. 27 minutes. This series includes eight videos or DVDs. Narrated by Greg Noll and Mike Hildebrand, authors of the text by the same name! Narrated by Mike Hildebrand and Greg Noll, this series illustrates the ideas behind the eight-step process in a series of videos intended to accompany their book. With nearly three hours of video, this series is useful for helping to satisfy the training requirements of OSHA's Hazwoper rule as well as NFPA 471 and NFPA 472. See individual program titles below. Pre-planning to set up a systematic, coordinated approach to a hazmat accident. Part of Hazardous Materials: Managing the Incident Series. Available separately or as a part of the series. Part of the Investigations Series. Available separately or as a part of the series at a discount. Describes how to carry out investigations of hazardous materials leaks, spills and explosions. Valuable for Hazwoper and Right-to-Know training! See individual title descriptions below. 20 high impact demonstrations on explosive and reactive chemicals! New update! Learn to avoid accidents and respond safely to incidents involving this deadly gas! Learn to respond safely to dangerous aromatic hydrocarbon incidents! 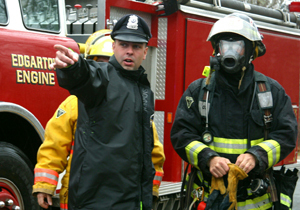 Learn how emergency responders identify unknown substances and prepare a defensive response! 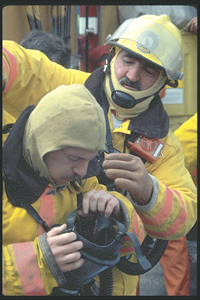 Training for emergency response personnel who may be called upon to respond to a leak, spill . Learn about EPA labels, symptoms of exposure, and first aid for victims of pesticide poisoning! Learn to manage LPG emergencies! Caustics are reactive ... Workers and emergency personnel must learn to avoid accidents and respond . Hazards of and safe response to the most widely encountered acids.